Trial test will be available from 25-Oct-2017. onwards for the candidates to have a feel of the online test and navigation functionality. Candidates are advised to go through them carefully to familiarize themselves with the screens, layout, and navigation. Is CMAT going to be conducted ONLINE twice a year? No. From academic year 2016-17 onwards, the CMAT exam will be conducted only once a year, The CMAT-2018 will be conducted on 20th January 2018. How is the computer-based online examination different from the conventional paper-based examinations? The computer-based online examination is more or less the same except that a candidate reads a question on a computer terminal and clicks on the correct answer, instead of reading on a paper booklet and using a pencil/pen to darken the ovals on an answer sheet. No. A candidate will have to take the test on a pre-assigned computer at the test venue. What does a Computer Based Test look like? CMAT trial test will be available on the website www.aicte-cmat.in from 25th Oct 2017 for candidates to get familiarized with the functionality and navigation of the actual Computer Based test. How many sections are there in the CMAT test? How many questions are there in each of these sections? Can I move back and forth between the four section? Will there be negative marking in CMAT exam? What is the scoring pattern and rule for negative marking? Candidates who are in the final year of the Bachelor's Degree (10+2+3) Programmes or who have appeared in the final year examination from a recognized institution/university can also appear in the test. For which programmes I am eligible after giving CMAT-2018 exam? Can I appear for CMAT for practice purpose, though I am aware that I am not eligible? Is there any age restriction for appearing in CMAT? No, there is no age restriction for appearing in CMAT. What is the fee for the test? The fee for General / OBC candidates appearing for CMAT is Rs.1400 + Bank charges as applicable; whereas for Female /SC/ST/PWD category candidates fee is Rs.700 + Bank charges as applicable. Candidates are appearing for test in India are required to pay registration fee either by Online (Credit / Debit cards / Net banking) or through Bank Challan at SBI bank. When and how do I register for CMAT January 2018? Can I use my coaching institute’s or a friend’s email address when registering for CMAT? Can I pay the fees through Bank Demand Draft or Cheque or Cash? Where do I pay my fees? No. Fees cannot be paid through Bank Demand Draft or Cheque. It can be paid through online or Cash at any of the SBI branch. For making cash payment, you need to generate Challan through the portal and visit the nearest SBI bank on the next day of challan generation to pay the cash. When will CMAT be held and can I choose a test city? CMAT in India will be held on 20th January 2018.. Yes, you can select up-to 3 cities in India giving order of preference towards your test city. The first choice of city will be given due consideration and weightage. However, actual allotment as per order of choice will be subject to availability of the slot in that particular city. From where can I get the list of test cities? You can PRINT your ADMIT CARD by going to website www.aicte-cmat.in from 05th January, 2018. The admit card will contain the photo, name and signature of the candidate, CMAT Roll number, test date, time, reporting time at the venue, venue name, venue address and brief instructions for the candidate. Will the Admit Card be sent to me as a hard copy by mail? No. Apart from the ADMIT CARD made available ONLINE on the website, the admit card will be sent to the email address provided by you. It is therefore, mandatory for you to have a valid email account throughout the selection process. Note: Admit Card is a mandatory requirement in order to take the test. You must bring a print out of your Admit Card to the test centre. What are the different Time Slots of the Test? There will be no different time slots. Test will begin at 9:30 AM on 20th Jan 2018. Candidates are required to arrive at the test centre on or before 8:00 AM for Security checks, Identity verification, and check-in. What are the timings to contact the helpline? Daily Webmail support will be available from 20th October 2017 – 10th Feb 2018. Queries, received by webmail, will be responded within 2 business days. Do not send the same email multiple times, as it will delay the response process. What if I generate the CASH Challan on 18th Dec, 2017? How can I proceed after that as the registration last date is also 18th December 2017? Can I pay the fees through Bank Demand Draft or Cheque or Cash? If you generate Challan on 18th Dec, 2017, you can pay the CASH from 19th Dec, 2017 onwards and complete the registration process by 20th Dec, 2017. For all existing users who have not paid their CASH after generating CHALLAN or are waiting for their data to get updated on the portal, the last date of application form submission will be 20th Dec, 2017. Can I change my preferred test city after I have submitted my form? No. No data can be changed once the form is finally submitted. After submission of CMAT registration fee, can I cancel my application and apply for refund of fee? Under no circumstances, cancellation of application and refund of fee will be allowed. If I do not take my test, will I be eligible for a refund? What is the reporting time for the examinations? <="" td="" style="margin: 0px; padding: 5px 10px; color: rgb(0, 0, 0); font-size: 14px; line-height: 20px; width: 731px; background-color: rgb(215, 215, 215);">One Hour and Thirty minutes prior to the test time. For the test beginning at 9.30 am, you must reach the test centre no later than 8:00 AM. What is the identification documents required to be carried to the test centre? a) SELF ATTESTED COPY of CMAT 2018 Admit Card with recent passport size photo pasted on it. Note: You will have to store all other personal items at the test centre at your own risk. Please do not bring any other items to the test centre, as they are not permitted into the testing centre. Does the name need to match with the names appearing on the identification documents? Your name needs to be exactly identical to the name on your Xth Mark sheet or equivalent for candidates appearing for CMAT. Note: - If the name has been changed due to events such as marriage, you must show the relevant document such as Marriage Certificate, Divorce Decree, Legal Name Change Document and submit a photocopy at the time of the examination of CMAT 2018 and interview and at the time of joining a programme at institutes. What are the permitted materials I can bring with me to the test centre? None. You will not be permitted to bring any personal items to the test centre, including but not limited to wrist-watch, cellphones, calculators, etc. What is the duration and pattern of the test? The total duration is 3 hours. The actual test will contain 100 questions. For further details, refer to Test Duration & Pattern. If I complete my exam before three hours, can I leave early? No. even if you complete the exam before the scheduled end time, you will not be allowed to leave the exam hall. You are allowed to leave the exam only after the scheduled three hours of exam are over. You cannot leave in between the exam even if you finish the exam early. Will I be provided with any scratch paper for rough work and calculations during the test? At the test centre, each candidate will be seated at a desk with a computer terminal and he/she will be provided with a scratch paper for calculations. Rough work cannot be done on any other paper/sheet, as nothing will be allowed inside the testing room. On completion of the test, candidates will have to hand back all the scratch paper to the Administrator. How do I get my Admit Card, whom should I contact? Who is eligible to take the test under the Physically Disabled category? Which are the acceptable testing devices that I can use/bring to the test centre? * Provided at the Test Centre only on the prior request. I am a PWD candidate with low vision / blindness / cerebral palsy. What special accommodation will be provided to me on the test day? What will be the time extension given to Visually Impaired or Cerebral Palsy candidates? Visually Impaired or Cerebral Palsy Candidates will be given a time extension of twenty minutes for every hour of the test, thus for 3 hour test you will get a total of 'One Hour' extra. What are the eligibility criteria for a scribe/reader? a. Is not a family member or a friend. b. Is not involved in any academic tutoring or preparation for the test to be administered. d. Has academic qualification lower than that of the candidate. Note: The age certificate of Scribe has to be presented at the Test Centre. A scribe will not be permitted to assist a candidate in case the above criteria are not met. Which universities / institutes will consider CMAT scores for admission? All AICTE approved Institutes / Departments / Constituent Colleges / Affiliated Colleges of Universities are expected to accept CMAT scores. The specific notifications issued by Universities and State Governments are available at CMAT website; www.aicte-cmat.in. If I have done Graduation through PART TIME or DISTANCE LEARNING MODE, am I eligible to apply for CMAT exam? Yes; as long as it is approved by respective statutory bodies. Will CMAT score be considered for admissions to Part Time MBA courses? 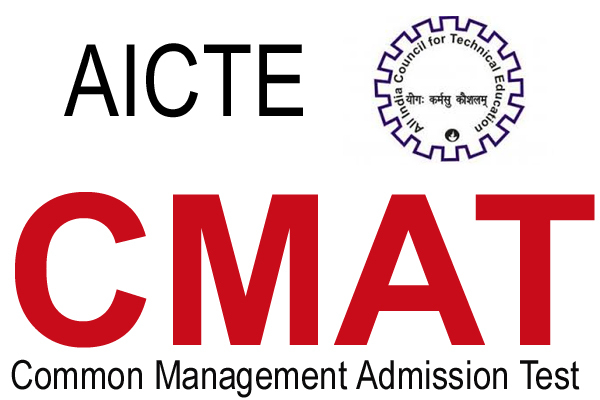 CMAT score will be considered for admissions to all AICTE approved part-time programs. Will there be a sectional cut off in the examination? No. there is no sectional cut off in the CMAT examination. How long is the CMAT-2018 exam score valid? The CMAT 2018 exam score will be valid for the admissions to academic year 2017-18 only. I have learnt that the test will not disqualify anybody, but will just give a rank to all test takers. The colleges, based on their individual merit list can decide if candidate of a certain rank is eligible for admission. Is the CMAT score only to rank candidates? CMAT has been designed to assess all the candidates who appear in the test based on their aptitude towards the management education in the order of their merit. The objective of the test is not to eliminate the candidates from the process of seeking admission in the AICTE approved management programmes, rather to facilitate the institutions to select the suitable candidates as per their merit. Can I give CMAT exam via paper pencil mode later in case I missed the Online examination? CMAT is a computer based online exam scheduled on 20th January 2018. It cannot be taken in paper-pencil mode. Is there any age restriction for taking the CMAT exam? No, there is no age restriction for taking the CMAT exam. Admit card will be available for view and print from Monday, 5th January 2018, onwards. You will have to log onto the CMAT website with your registered User ID. You will be eligible for an Admit Card only upon submission of online application form. I belong to SC/ST category.How many seats in M. Pharmacy are reserved for SC/ST category students? or If I qualify in GPAT 2018 Examination then am I assured of scholarship in M. Pharmacy? Will the Admit Card be sent to me as a hard copy or by mail? No. The admit card will be only available on the CMAT Website when you log on using your CMAT User ID. Note:Admit Card is a mandatory document required to take the exam. You must bring a print out of your Admit Card to the exam centre. If I have made any mistake(s) while registering for CMAT 2018, can I make changes later to rectify? You may select “Existing User Login” on CMAT website to make changes to your personal details, such as address, educational information or exam city preferences. For security reasons, editing of candidate’s full name, date of birth, email id, mobile no, State and Country will not be allowed. However, if you have genuinely made a mistake in entering your Date Of Birth, State, etc., you will have to show evidence of the correct data at the time of examination/interview/admission else your candidature will be nullified. Note: The ability to edit application profile will be available only until you have not submitted the Application Form. Once you have submitted and made the exam fee payment, you will NOT be allowed to make any more changes. You may only view and print thereafter. ID. Your CMAT 2018 application will be considered for the latest registration and Admit Card issued for the same. Note: You will not receive a refund or Admit Card for your earlier registration. Failure to re-register in such circumstances may lead to nullification of your candidature. In case the website does not work and I am unable to complete my application, what should I do? If the registration website is not accessible for any reason, please close your Internet browser and try again. Also, ensure you are using the correct version of the Internet browser recommended: The Registration/Application form is best viewed in Mozilla Firefox and Google Chrome browsers. Does CMAT 2018 have a syllabus for exam preparation? No, the CMAT exam does not have a defined syllabus for CMAT preparation. However, you can take our mock test to understand the pattern of exam and types of questions. Check the CMAT website regularly for the announcement of mock test. Mode ii) CASH Payment in SBI bank: You can select this option to pay by CASH at any of the designated SBI bank branch. Once you select this option and proceed, you will see a CHALLAN on your screen with your details already filled in it. You need to take 3 PRINT OUTS of this CHALLAN, fill in the details wherever required in all the copies, and walk in to your nearest SBI bank branch with CASH on the next day of generation of Challan. Cash Deposit will be accepted only from the next day of your Challan generation. E.g. If you Generate and Print the Challan copies on 24th October, 2017, then walk in to the nearest SBI bank branch with Challan copies and deposit the CASH by 25th October 2017 onwards. NOTE: The last date to pay ’CASH’ in bank is 19th December 2017 and from there onwards to complete registration is 20th December 2017. Submission of final application after payment (CASH PAYMENT THROUGH BANK) will not be possible after 20th December, 2017.